What the hell is wrong with you San Francisco? 9 AM, really? There’s really a massive brunch crowd with a line out the door at 9 AM? I was convinced that for once we were up early enough to beat the brunch rush at the perpetually swamped Nob Hill breakfast and lunch only joint Mymy, but no. So we put our name on the clipboard and wandered half a block to Contraband for a spectacular cup of coffee. Then we joined the masses that were already flowing into the streets and waited for our name to be called. Fortunately, the line moved surprisingly fast and we were seated inside in no time flat. 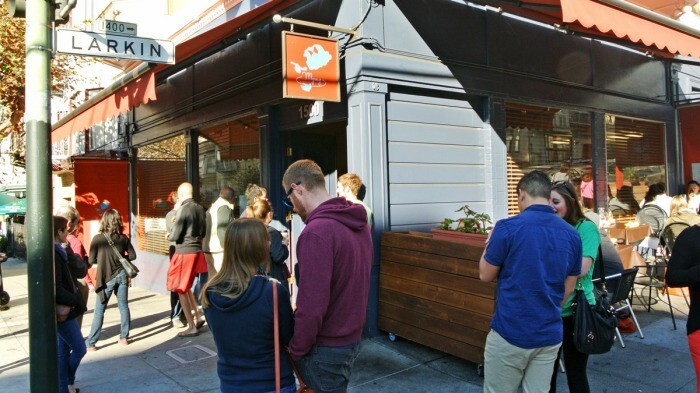 Once seated, I took a moment to look around the miniature (by SF standards) eatery and see if I could figure out what was drawing the crowds. Well, for one thing, everything about Mymy was absolutely adorable – from the decor to the food. And every dish I saw go whizzing by looked equally as cute as the place and had generous portions to accompany each incredibly detailed plating. Also, the entire kitchen and wait staff were constantly moving lightening fast throughout the entire compact space, servicing everyone as quickly as possible. Well, it had all the signs of a great brunch joint; let’s see how the food fares. As soon as the waitress came over, we ordered a carafe of mimosas and put in our selection of twists on brunch time classics. 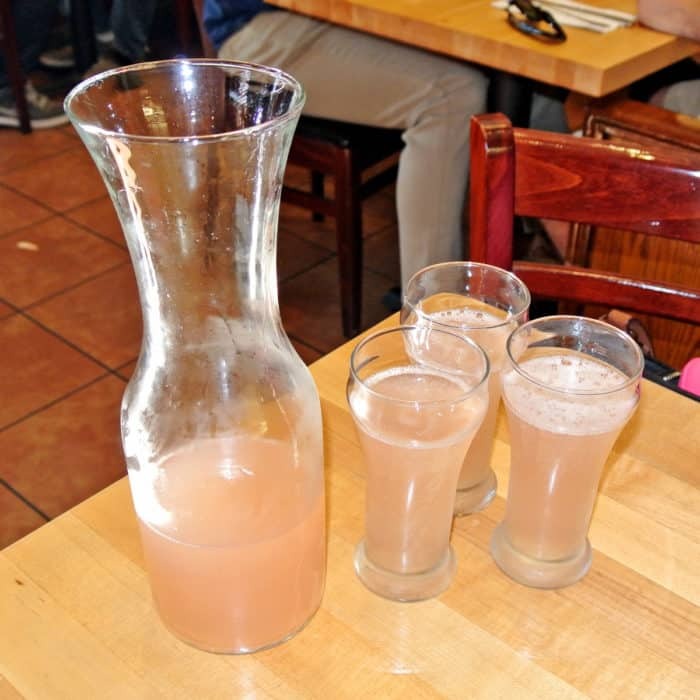 The Mimosas were actually really outstanding and a pretty darn good deal at only $17 for the whole carafe. There was certainly enough booze in there to successfully perk the three of us up using the old tried and true hair-of-the-dog method. Solid brunch cocktail: check! But those twists on classic brunch dish, oh my Mymy. That’s what we came for. Every single thing on the menu sounded better than the next – it was so hard to choose just two. 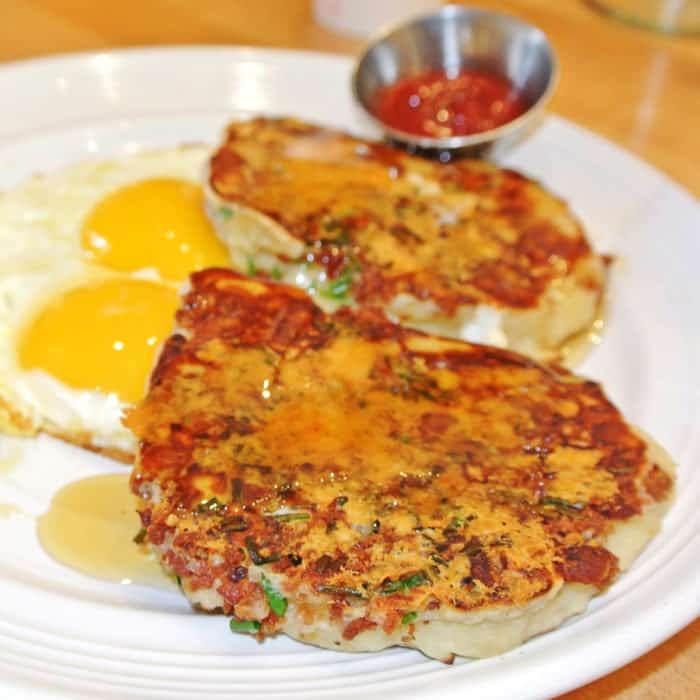 Ultimately, I chose a dish from the Benediction portion of the menu and Amy settled on a crazy sounding savory option called Chive Potato Pancake with Crispy Crumbled Bacon & Gorgonzola served with two sunny side eggs. Jeez, where to even start with this one? The chives and funky, creamy gorgonzola dolce made for an incredibly delicious and unusual flavor combination when mixed with the ricotta flour pancake dough. This was especially true after also taking a swipe through the runny egg yolks that had spilled out across the platter. They came pre-drizzled with a ton of honey, perhaps too much for either of our tastes actually. We felt that the syrupy sweetness sort of distracted from the savory glory of the dish. But, this dish was totally delicious nonetheless and presented the classic sweet and savory combination in a really unique way. My dish, on the other hand, a twist on the classic Eggs Benedict called Lemon Crab Shrimp Cake Benediction was unquestionably unbelievable. 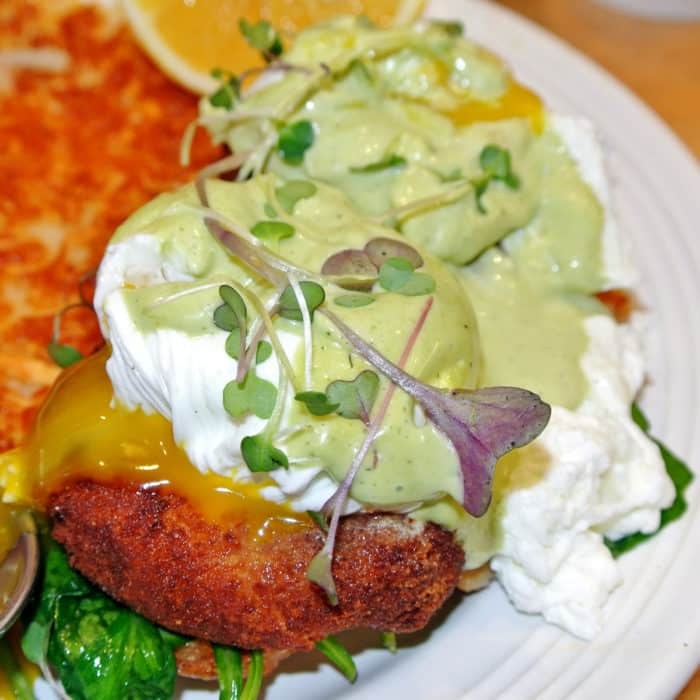 The poached eggs were served over large, plump, golden, crisped shrimp and crab cakes with toast, garlic sautéed spinach, and plenty of creamy lemon dill sauce. The crab and shrimp cakes were absolutely loaded with seafood. And actually, they would have made a great dish on their own, but adding poached eggs on top only made them even better. I’m generally not the biggest fan of dill, but in this dish it was absolutely perfect. The creamy herbal sauce tied the seafood cake, eggs, and bread together so well and turned this into a truly memorable brunch dish. Even the hash browns were excellent. They were thin and super-crispy, just how I like ’em. Really, every single bite I took from this dish contained an explosion of wonderful brunch flavors and textures. It became all too evident to me that this was a very special San Francisco brunch place. On subsequent visits, we’ve explored more of the over-the-top brunch offerings including 6hrs Corned Beef Hash. 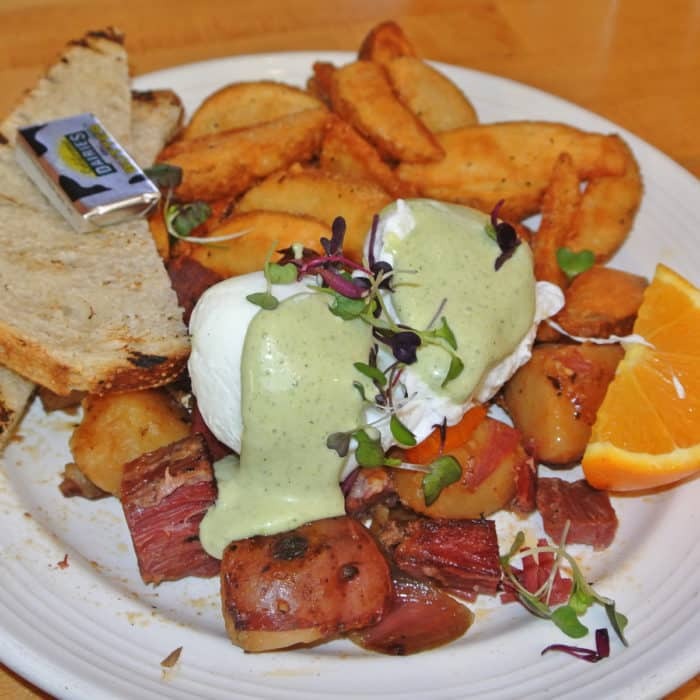 This dish involves large hunks of salty, briny, fork-tender corned beef serves along with super-crispy homefries, hashbrowns, runny poached eggs, and plenty of creamy sauce. It’s as good as it sounds. But, even more in-your-face and fully-flavored is the Chorizo Jalapeño Tartine. 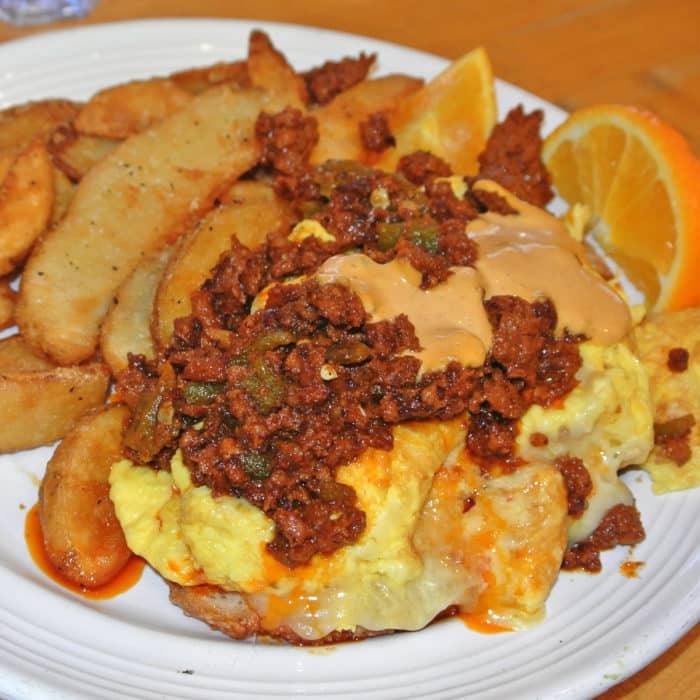 The dish involves topping a thick slice of bread with fluffy eggs that have been scramled with a heap of crumbly red chorizo and spicy jalapeno bits. This too came with those same awesome potatoes and hash browns and was topped with a smokey, creamy sauce that really pushed it over the top. I’m typically drawn to savory dishes, but I could leave you guys without talking about the insane pancakes served at Mymy. Recently, I tried the Banana Blueberry Souffle Pancakes which were uhhhh-mayyy-zing. They’re made super-thick and fluffy, like absurdly fluffly. 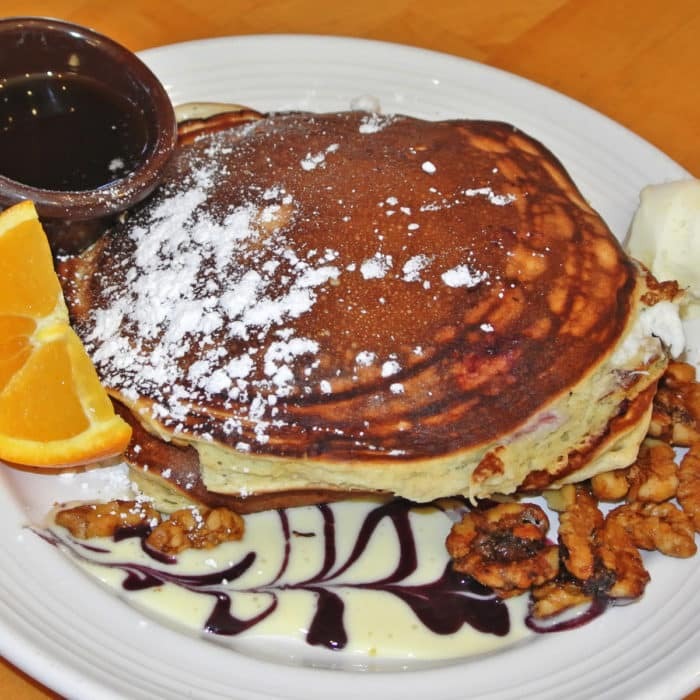 And between each layer of pancakes, they include a gigantic dollop of mascapone for additional creamy sweetness. There ain’t nothing wrong with these. So, although I don’t particularly enjoy waiting in lines for food, Mymy is worth it. 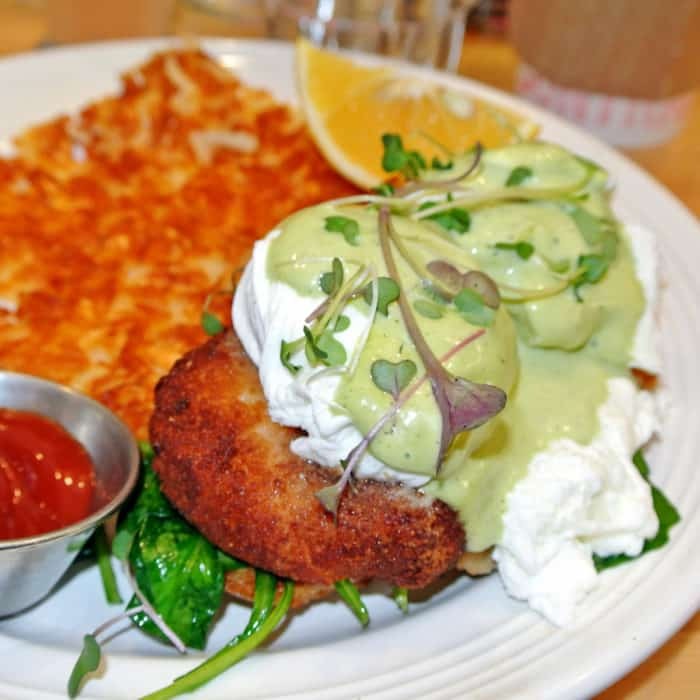 The lines moved pretty quickly and everything they served was exactly what I want out of brunch – interesting, filling, flavorful and reasonably priced food. 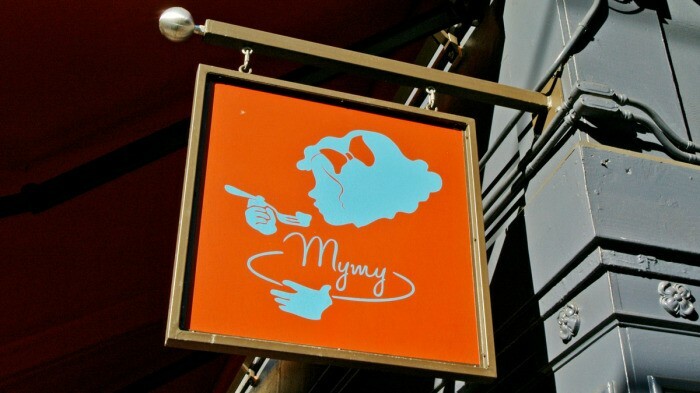 Mymy is a San Francisco brunch gem. 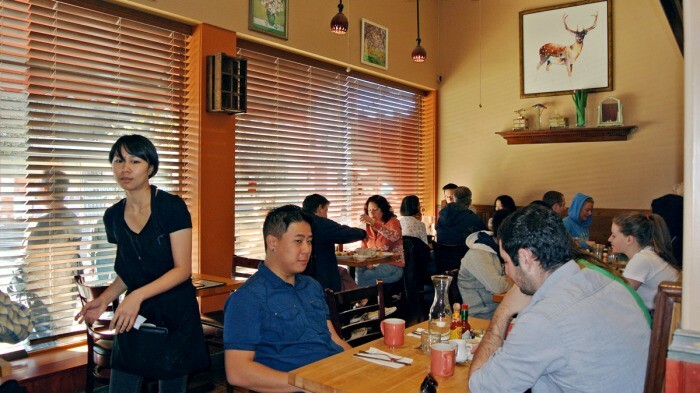 Where do you go when you’re looking for an excellent brunch in San Francisco? Let me know in the comments below.